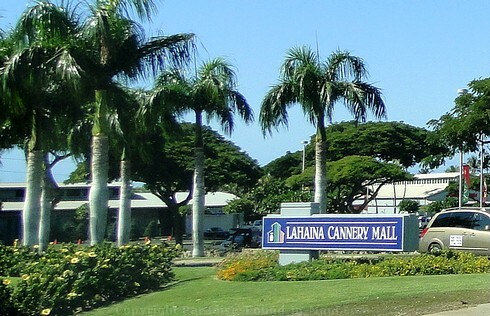 The Lahaina Cannery Mall: Ever Wonder Where it Got Its Name? 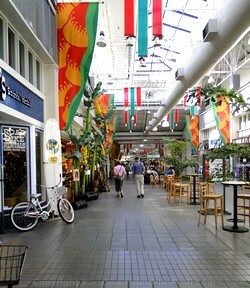 Built in the late 80's, the fully enclosed, air-conditioned Lahaina Cannery Mall sits on the site that was home to the Baldwin family pineapple cannery for over 40 years. Who would have thought we'd be shopping in Maui where they once packed thousands of cans of island pineapple each day! The mall has a selection of shops including island clothing, jewelry, and specialty shops where you might find a cool souvenir or two. 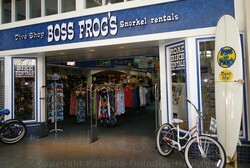 There is a Boss Frogs Dive Shops where you can pick up some snorkel gear (to buy or rent). And of course, you can't go shopping in Maui without an ABC store, so they've got that too. The mall is anchored by a 24 hour Safeway and a Long's Drugs. But they offer more than just shopping in Maui: they offer free cultural activities and, if you're hungry, there are several handy spots to grab a bite to eat. They have the casual Casa Maya Mexican Restaurant where we picked up some yummy burritos to go, plus a small food court. The food court is home to L & L Drive Inn restaurant, which, contrary to the name, is neither a drive-in nor an inn! If you're looking for a Hawaiian Plate Lunch, Hawaiian BBQ or some Loco Moco this is the only place in the mall to get it. We ordered a specialty combination plate lunch for $8.50 (macaroni salad, rice, and a meat dish) so we'd get more than one meat dish to try. I thought the food was ok, pretty much what you'd expect from a mall food court joint. They offer some free cultural activities and shows that are perfect if you're looking to get a taste of Hawaiian culture without breaking the bank! Every Tuesday and Thursday evening at 7 p.m. they put on a free hula show, there are free keiki (children's) hula shows on the weekend afternoons, and free ukulele lessons every Tuesday at 5:45 p.m. They are open 7 days a week, but close early at 7 p.m. on Sundays. Before you go, head over to their website to print off some coupons. 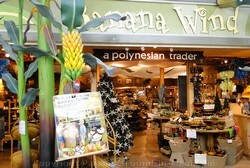 You can also check the Lahaina Visitor Center where we picked up our pamphlet of Lahaina Cannery Mall coupons. Once you're in Lahaina Town, head north along the Honoapiilani Highway. You won't be able to miss the Lahaina Cannery Mall on the left side of the highway where it intersects with Keawe Street. The mall address is 1221 Honoapiilani Highway.